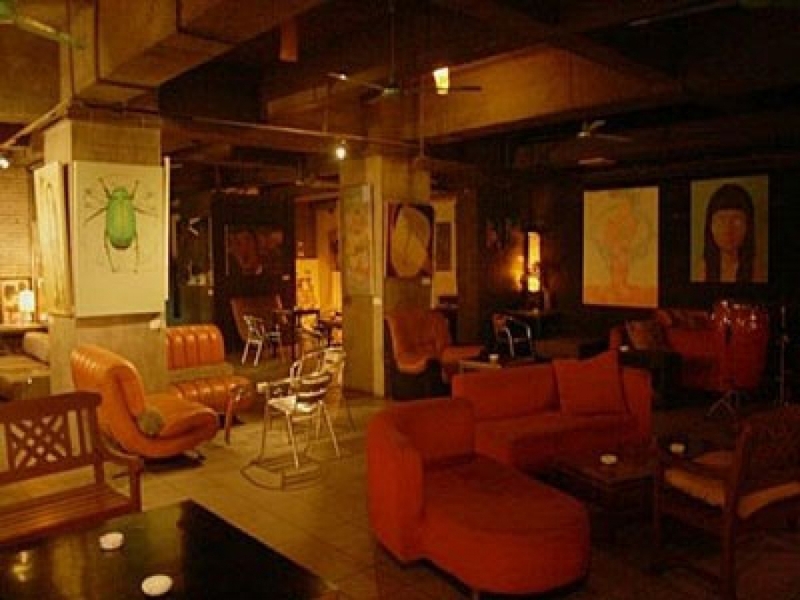 Tucked away and a bit difficult to find but well worth the effort, is a bar inside an art gallery that originated as a factory. Intrigued yet? In what has become a trend in recent years, several artists have renovated an old pre-Cultural Revolution Chinese factory and craftily remodeled it to reflect the new Chinese art scene that has begun to surface the last few years in China’s bigger cities. The most famous are 798 Art District in Beijing and Shanghai’s Moganshan. Originally opened in 2003, the place was given the moniker Park 19, and soon became one of the city’s best spots for artists, musicians, sculptors, etc, to present and appreciate the city’s newest art momentum. It was later renamed Loft 345 because it occupies the 3rd, 4th, and 5th floors of the Xiao Gang Hua Yuan Building. Its interior and formerly white walls have a distinctly artistic feel to it now that they are covered completely inch by inch by ornately expressive graffiti and color. Inside, there are around 40 fully operating living/working studios that are rented out. The expositions are mostly from the Guangzhou Academy of Fine Arts and usually run for one or two months because the bar specifically strives to allow students the opportunity to exhibit their work. The bar is open everyday but Monday from 9pm on and every night there are different highlights. There is an open music circle on Thursday nights. The bar is well known for its music scene and variable genres of music played. From jazz to funk, blues to folk, punk to experimental, the diversity provides an atmosphere pleasing every musical niche. There is even a spoken word night that is currently held the first Sunday of every month. Getting there: Line 2, Jiang Nan Xi Station, Exit C. LOFT345 is about 400 meters east from the station, along the river / Jiang Nan Dong Lu (Jian Nan East Road). Walk along the river until the brick workshops end, and then enter the left gate to the white building.